In 10-inch skillet, heat oil over high heat until hot. Add pork; sprinkle with salt and 1/8 teaspoon pepper. Cook 3 to 5 minutes, stirring frequently, until browned. 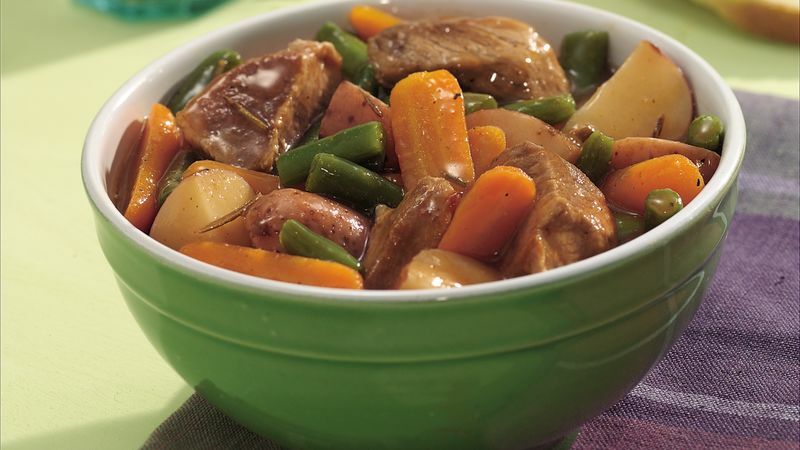 In 3 1/2- to 4-quart slow cooker, mix pork and remaining ingredients except green beans. About 20 minutes before serving, stir thawed green beans into stew. Increase heat setting to High. Cover; cook 15 to 20 minutes longer or until green beans are tender. In a rush? Skip the pork-browning step. The recipe may have a bit less flavor and color, but saving prep and cleanup time on busy weeknights is worth it. Add the beans at the end of the cook time so they remain firm and green and don't overcook.